MISS ALABAMA Callie Walker preps for next month’s Miss America pageant. TASTE OF T-TOWN Real & Rosemary serves up fresh, home-cooked, healthy meals. BACK TO SCHOOL SO SOON? Ready to head back to school? Local teachers have some advice. It’s hard to believe, but yep, it’s August. And I don’t know about y’all, but I can’t wait for the temps to cool and the football to start. This month’s issue of Druid City Living is packed. We’re catching up with the new Miss Alabama, Callie Walker, as she readies for the upcoming Miss America pageant. And, since students and parents have back-to-school on the brain, Faith Henley caught up with some past DCL Teachers of the Month for a little advice on how to make the transition a bit smoother for everyone. I must say, of all the stories we’ve brought you through the years, Amanda Roberts’ is a favorite. Roberts recently won gold and bronze at the Special Olympics USA Games in Seattle. Amanda, you are an inspiration to us all – and congratulations on your success. The Community Foundation of West Alabama named its 2018 class of Pillars of West Alabama in June at the Indian Hills Country Club. Each year, the board of directors selects recipients based on their life’s contribution to the West Alabama area. This year marked the 15th year of the program. The 2018 class of honorees included (front row) Billy McKinzey, Buddy Burton, Lyda Black, and Harrison Taylor; (back row) Jimmy Warren, Bev Leigh, and Glenn Crow. PAD PERIPHERAL ARTERIAL DISEASE IS SERIOUS. PAD screening is painless and free. One in 20 Americans over the age of 50 has Peripheral Arterial Disease, or PAD. If you’re feeling tired, have pain in your legs when you walk, or have a history of diabetes, heart disease, high blood pressure or high cholesterol, don’t risk it. Get tested for PAD now. IT’S PAINLESS, NON-INVASIVE AND FREE. And it might just save your life. To learn more about PAD and to schedule your FREE SCREENING go to PADAwarenessDCH.com or call 205-750-5521. DIFFERENCE Follow these tips to lower your power bill. Clean air filters increase AC efficiency. LED bulbs use less energy. Keep your outdoor AC unit free of leaves and debris. For more ways to save by making your home more energy efficient, visit AlabamaPower.com/tips. but once worry takes over, the concerns become preoccupations that are more harmful than helpful. Fear, on the other hand, is great to have as a parent. Fearful impulses can protect our children from situations and people that may cause them danger. Welcome change. Your Beaux William (right) and his friends (from left to right), Sam and Silas Barrett, pose with an astronaut on the first morning of camp. Church of the Highlands’ annual summer child’s camp, “Summer Blast,” had a 2018 theme of “Outta this World.” Photo: Marlena Rice milestone means Marlena Rice is a busy mom and they’re entering a new stage of dewriter who lives in Tuscaloosa with velopment that will aﬀect the adult her husband, Rod, and their son, they’ll become. Welcome the growth Beaux William. Check out her blog at and what you’ve taught them! heartfullybuilt.com. me a year to nail up (yes, when he was out of town I sure did) a blackout curtain! I’m sleeping like a baby this week. Infuse water with fresh Alabama grown berries, lemons… whatever makes you feel healthy. Keep icy water by yours and the kids beds in one of the pretty pitchers you save for some special occasion. Stick a ﬂower from the yard in one of those “love” Coca-Cola bottles. Light a candle, close your door, and peruse Grab a pretty pitcher, fill it with berries and ice water, and kick back a bit before the summer comes to a close. all the magazines that Photo: Allison Adams you didn’t have time Add some music, a little natural light, to read while schlepand watch the end of the year be the Allison Adams is a mom of four and ping kids to activities. best part yet in the oﬃce. a Realtor with Lake Homes Realty Week four: Yes, work is calling, The last week begins with a full serving Lake Tuscaloosa. For combut you can also make changes there. moon. Make a date to catch a glimpse ments, email aadams@lakehomes. On your desk, add essential oils, or a of it every single night this week, until com. candle. The smell of lemon increases alertness. Rosemary helps ﬁght mental it leads you into Labor Day – your bonus for another chance for all things fatigue. Cinnamon improves focus. summertime. Peppermint brings clear thinking. It’s still your summer. Make it a Keep that water available at work to get the eight cups a day you neglected memorable one! Blessings, to get over the summer. A box or tray with dark chocolate and nuts within Allison reach will help keep the mind clear. programs, while necessary, can be draining on both the patient and the caregiver. activities. In addition, there may be physical therapy programs or other therapy programs that have to be A new style of recovery option has become available in recent years. These centers allow patients to g on both patient and family caregivers. Hospital stayscan are expensive completed. These programs, while necessary, be recover quickly withpatient professional that help both mental and physical health. before they draining are ready to resume daily activities. In addition, there on both the and theservices caregiver. the Alabama Retail Association’s 2018 Alabama Retailer of the Year, including: Chick-fil-A (Northport), Left Hand Soap Co. (Tuscaloosa), The Locker Room (Tuscaloosa), Mobley & Sons (Tuscaloosa), The Shirt Shop (Tuscaloosa), and Piggly Wiggly (Tuscaloosa and Northport). Finalists will be honored at the annual Alabama Retail Day luncheon in Birmingham on Oct. 16. 3 Jennifer Naves has been named VP/Mortgage Banking Officer at BBVA Compass. Naves brings over 12 years’ experience in the banking and mortgage industry to her new role. She can be reached at jennifer.naves@bbva.com. 4 Mellow Mushroom is coming back to Tuscaloosa. The pizza restaurant closed its doors at its downtown Tuscaloosa location in August 2017, but plans are in the works for a new restaurant. Details about the exact location and an opening date are still being worked out. closetsplus.com | 205.333.7300 Whether you are installing the closet yourself or using a professional taking stock is always step one. Counting clothing items and measuring hanging clothes is necessary for a good result. We have worked with over a thousand homes in the last 25 years. We can often look at a closet and know almost intuitively the best arrangement for your particular assortment of belongings. It may take a more methodical approach for a do it yourselfer. There are lots of lists online about how to count and measure for the closets you need. Our overall cost is typically only about 5 percent more than doing it yourself from a big box store. For example, 5% is $25 on an average job. Without the aggravation and time to learn how to do what we do expertly. normally generates the stress, and plan ways, as a couple, to help reduce those during family activities. Close, continuous, and unstructured time for days on end, even with family members you enjoy most, is stressful. These can lead to emotionally charged situations. Because the stress of a holiday or vacation season can expose any weaknesses or unresolved issues in your relationship, it may be best to build in some kind of “safety valves” into your plans to let one another decompress when stress strikes. A proactive plan may include pre-arranged signals to indicate to each other when you need a timeout, and an agreement to allow the other person to retreat from one another or other family members for a short time. own kind of stress on the marriage and on the family. The important point is to remember not to make any major life decisions if your ability to think clearly is compromised by your emotional reaction to stress. If you plan ahead going into these family situations, and allow one another the space you each need to be alone and decompress, you can increase the chances of enjoying the pleasures the holidays or vacation season can bring, while minimizing the stressors. If you can both focus more on the positive aspects of what you have as a family, you increase the chances that you can approach your marriage with the renewed optimism and energy you will need to make other necessary changes. Larry Deavers is a Licensed Clinical Social Worker and Executive Director of Family Counseling Service in Tuscaloosa. April L. Stevens, LICSW, PIP, is a Licensed Clinical Social Worker and counselor with Family Counseling Service in Tuscaloosa. Check out any daycare waiting list in Tuscaloosa, and you’ll quickly ﬁnd out that Tuscaloosa is having a baby boom right now. Sure, those waiting lists have always been on the long side, but folks in the childcare industry tell me this is one of the biggest baby booms this city has seen in recent years. And, if you’ve run into me at the grocery store lately, you might have noticed… my expanding belly has now morphed from “food baby” to “baby baby!” As pregnant ladies, we get the constant message from our doctor to stay active. But as we journey from one trimester to the next, that recommendation often seems easier said than done. But fear not, my fellow pregnant gals, I’ve spoken to the experts in town, and I’ve got some tips for us all. “For women who were not exercising before getting pregnant, and who get clearance from their doctor, I’d recommend getting moving as soon as you feel up to it by beginning a walking program, swimming (yay for buoyancy!) or stationary cycling,” said Nix. Consider Your Pre-Pregnancy Fitness Level Give Your Body Grace (and Talking with your doctor and being Avoid Comparison) realistic about your current ﬁtness level is incredibly important, according to Certiﬁed Health Education Specialist and personal trainer Neika Nix. If you weren’t training to become a contestant on America’s Ninja Warrior prior to pregnancy, you probably don’t want to start now that you’re with child. #ﬁtpregnancy on Instagram unless you’re planning on training for the CrossFit games two weeks after birth.” For more information regarding physical activity during pregnancy, visit americanpregnancy.org, and always consult with your doctor about exercising during your pregnancy. In addition to a packed schedule of interviews and appearances, Walker is busy preparing to compete in Miss America. The annual pageant of women representing each state takes place on September 9 in Atlantic City, New Jersey. “I am constantly working on my talent at the dance studio, preparing for interview with mock interviews, and staying active to feel my best on the Miss America stage,” Walker said. “My mom is my ballet teacher, so she has always told me ‘Prepare, prepare, and prepare so that you can enjoy the ride.’” Pageantry is a family aﬀair in the Walker household. Walker’s mother, Angela Tower Walker, was crowned Miss Alabama in 1985. She came in fourth runner-up at the Miss America Pageant later that year. Since 1921, Miss Alabama has only placed in the top ﬁve at Miss America 22 times and won three times. Top: Miss Alabama, Callie Walker, shares a touching moment with her mother, Angela Tower Walker (Miss Alabama 1985), shortly after being crowned. Bottom: Callie Walker became the new Miss Alabama during the pageant held at Samford University on June 9. She will compete for the Miss America title in September. Photos: Miss Alabama Pageant, Inc.
Each Miss Alabama chooses a cause she feels is important that she feels is important to champion during her reign. Walker’s chosen platform is about teaching young people to live an environmentally sustainable lifestyle. “I would love to implement a sustainability program in as many elementary schools as possible,” Walker said. “I truly think educating elementary school age children about the importance of living a green lifestyle will help create good stewards of the planet for generations to come.” Walker has already begun teaching local children the importance of the three R’s of sustainability – reduce, reuse, and recycle – through her campaign “Let’s Talk Trash – Green Kids for a Green Planet.” She thinks a better environment and future for Alabama starts with our youth. “It is a fact that the state of Alabama is behind when it comes to addressing sustainability. This is incredibly important to guarantee that our state, as well as our nation, continue to be beautiful and clean.” You can watch Miss Alabama Callie Walker in the 2019 Miss America Pageant on Sunday, September 9 on ABC. Callie Walker visits with youngsters at a recent “Let’s Talk Trash” event. Walker’s Miss Alabama platform stresses the importance of living a green lifestyle. Photos: Miss Alabama Pageant, Inc.
she was our little ﬁsh, because she learned very quickly how to swim,” Kim added. With all of the struggles that Amanda has faced, Kim said swimming was one way that her daughter could succeed. “You have to measure success in baby steps sometimes,” Kim said. “We’ve always had pools at our houses, and it’s always been a great family activity. 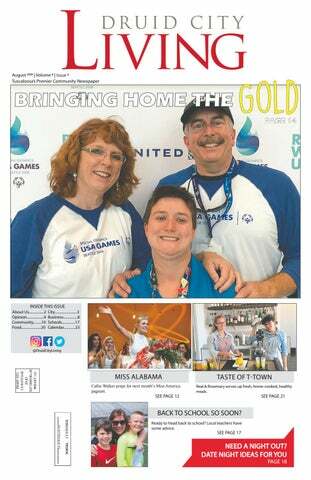 Compared to all of the other struggles that she was going through, that was kind of a time to relax and play and be successful.” In 2006, Amanda started swimming competitively on the Special Olympics swim team through PARA’s Therapeutic Recreation program, where she has been coached by Amy Williamson. Williamson said Amanda is always eager to learn and improve her swimming. water, several inches in diameter, was seen gushing from the riverbank at a point that was dry before the shaking. According to contemporary reports, the earthquake struck Charleston at about 9:50 p.m. and Tuscaloosa at 9:30 p.m. Since time zones were not then in use, these were probably local times that were then based local noon – when the sun was directly overhead. Adjustment of Charleston time to Tuscaloosa time indicates the shock waves took about 10 minutes to cover the 440-mile straight-line distance. This would be equivalent to a speed of about 2600 miles per hour, or 1.2 kilometers per second, and it appears to be within the accepted range of earthquake shock wave velocities. In general, earthquakes are a rare phenomenon for much of Alabama. But the quake of August 31, 1886, demonstrated that many structures, even masonry ones, may need additional reinforcement – even in areas like Tuscaloosa, that were previously thought to be safe. About the Author Jim Ezell is a retired engineer, historian, and author. His newest novel, The Cistern, was published in Dec. 2017. The Cistern is an adventure/crime novel set in Tuscaloosa and ﬁctional Tombigbee County in the Alabama Black Belt. The Cistern is available on Amazon. com. Top: A collapsed business in Charleston, South Carolina. Image courtesy of the US Geological Survey Photographic Collection. Middle: A partially collapsed residence in Charleston, South Carolina. Image courtesy of the U.S. Geological Survey Photographic Collection. Bottom: A structural bolt on Clark Hall erected on the University of Alabama campus in 1884. These bolts were installed in the 1940s to stiffen the building and pull the walls into a vertical position in a similar manner to work pioneered in Charleston after the 1886 earthquake. Photo by the author. By Faith Henley Shortly before Hurricane Katrina in 2005, Justin Ray and his wife were living in New Orleans. While living in such an economically and culturally diverse city, he says he learned that access to a great education shouldn’t be limited to anyone, regardless of socioeconomic status. Ray brought that mindset with him and used it to become the teacher he feels Tuscaloosa students need to succeed. “I have seen students overcome immeasurable obstacles to succeed and break horriﬁc cycles of familial behavior, insisting that their life should amount to more,” Ray said. “When I see how hard they work, and how willing they are to face life’s hurdles, it makes me want to endeavor to my utmost to ensure that they have every tool I can give them to make their eﬀorts successful.” Ray has returned to his hometown of Tuscaloosa, where he taught at Hillcrest High School for seven years. This fall, he’ll begin a new chapter, teaching high school English at Northside High School. With almost a decade’s worth of experience, Ray’s attention has turned to encouraging and mentoring the younger teachers he meets. Romance doesn’t come easy in the summer. Whether it’s hectic travel or work schedules, kids that seem to be around all the time, or the sweltering Alabama heat, chances are your relationship could use a little TLC. Here’s a few ways you and your partner can relax, refresh, and recharge this month. Catch A Show What better way to enjoy some of the warm nights of summer than with live music? Grammy-nominated R&B musician Charlie Wilson takes the stage at the Tuscaloosa Amphitheater on August 10. The Amp also hosts the highly-anticipated Keith Urban concert on August 26. Urban will be joined by up-and-coming artist Kelsea Ballerini, who has taken the country music scene by storm. Feeling a little old school? August 20, Def Leppard and Journey will be just a short drive away at the BJCC. The tour has proven to be a great time for classic rock fans, young and old. Switch-up the Classic Dinner Date More than likely, your go-to date night consists of a select few restaurants kept on rotation. The best way to turn this date night classic into a special memory is to try a place that’s brand new, or at least new to you. There’s plenty of unique options popping up around Tuscaloosa, so you can stay close to home, including The Brass Tap in Midtown Village. With an atmosphere that’s cozy, but not too serious, amazing food, and endless drink options, Brass Tap is a perfect date locale for any relationship. Go on one of their Bingo or trivia nights and join in some friendly competition, or you can grab one of their many games for just the two of you. Either way, you and your partner can spend hours here without even realizing it. Whether you are on an awkward first date in need of an ice breaker, or you’re two long time lovebirds looking for something different, this is the place for you. Photo: The Brass Tap, located in Tuscaloosa’s Midtown Village, features a full food and drink menu that gives you plenty of options. Take it Outside Take advantage of Tuscaloosa’s extended summer weather and its multitude of beautiful outdoor spots by taking your date outdoors. Pick one of Tuscaloosa’s beautiful lakes and make a mini-vacation out of the afternoon. You can find swimming access all around Tuscaloosa, but if you’re looking for even more, try out Lake Lurleen State Park. While relaxing on the beach and enjoying the safe, designated swimming area, you might almost forget you’re still in Tuscaloosa. For even more adventure, the park offers low-cost rentals of a variety of boats and paddle boards. A romantic date out in canoe or paddle boat has made its way into more than a few classic love stories (ahem The Notebook ahem), and you can recreate the magic right here at home. And it there’s a torrential downpour? Again, see: The Notebook. Photo: Located just nine miles northwest of Tuscaloosa and Northport, Lake Lurleen State Park offers boat rentals. Try Local Craft Beer There has been a definite rise in popularity of craft beer over the past few years, and it’s no surprise the unique community here in Tuscaloosa took on this trend very early. “I believe we’ve been successful because we provide a slightly different atmosphere,” said Elliott Roberts, co-owner of Druid City Brewing. “We focus on live music, local beer, and creating an atmosphere that’s kind of quirky. I think a lot of the other breweries try to do that as well.” Tuscaloosa is home to several breweries that provide local brews to bars across the state. If you haven’t tried one out yet, consider it added to your “must-do” list. With award-winners like Druid City Brewing in town, this is a trend that’s here to stay. Photo: Sip some great, local craft beer while admiring Druid City Brewing’s ever-changing, but always interesting chalkboard art. Salsa Verde Chicken Entrée and Mini Pecan Sticky Rolls: Yum! Now that school is starting back, you can draw everyone to the table for a little family time – using what else? Food! If you’re in the mood for a delicious entrée, but you don’t have a ton of time, this salsa Verde chicken is the way to go. And if you’d like to make a great dessert or a tasty breakfast treat, these mini pecan sticky rolls are sure to please. Sprinkle with salt and pepper. Top with remaining salsa. Place chicken on a bed of rice, and top with tomatoes and cilantro. Serve immediately. In an 8x11 baking dish, layer 1/2 of the salsa. Place chicken breasts side by side on top of salsa. Bake for 40 minutes, or until chicken is cooked through. Remove from oven, top with cheese, and place under broiler for a few minutes until cheese is brown and bubbly. Here’s hoping you have a wonderful August, and as always, bon appétit! Amy Poore is a Tuscaloosa mom, wife, and foodie. To see more of Amy’s delicious recipes, visit her blog, Poore Amy, at pooreamy. com. Photos by Amy Poore. MINI PECAN STICKY ROLLS • 1/3 cup packed light brown sugar • 1/3 cup butter • 2 tablespoons light corn syrup • 1 teaspoon milk • 1 can refrigerated crescent rolls • 1 tablespoon sugar • 1 teaspoon cinnamon • 3/4 cup chopped pecans Preheat oven to 375 degrees. In a small sauce pan over low-medium heat, combine butter, sugar, corn syrup, and milk. Stir until melted and completely combined. Spray a 9-inch cake pan with cooking spray and pour in sugar/butter mixture. Evenly sprinkle pecans on top. Take the four rectangles of crescent rolls and pinch seams to make solid rectangles. Evenly divide the sugar/ cinnamon on one side. Roll up, starting on the long side. Pinch edges to seal. Cut each roll into 9 pieces and place (starting in the middle and working out) in the prepared dish. Cook for 15-18 minutes or until golden brown. Remove from oven and let sit for 1 minute, then invert onto serving plate. Serve immediately. and a Mexican vanilla ice cream free of preservatives from Austin, Texas, the ice cream sandwich bites will be sure to make you an R&R regular. And if that’s still not enough, keep in mind that Real & Rosemary has a full bar with beer and wine served all day, and special curated cocktails available after 4 p.m. For more information on Real & Rosemary, including directions and to order online, visit realandrosemary. com. Every year, around 50 feature ﬁlms and 100 short ﬁlms are screened – selected from over 1,000 submissions. And the ﬁlms cover virtually every genre – from drama to comedy to horror, as well as documentaries and children’s movies. Films that make the festival circuit may not necessarily make it to our local multiplexes. These are the celebrated, oﬀ-the-beaten-path ﬁlms that you won’t get to see anywhere else. In addition to great ﬁlms, Sidewalk is also a place for great parties. Okay, yes, the whole thing is one giant downtown block party, but specialized events keep the weekend jumping. There’s the Filmmakers’ Welcome Reception on Thursday, August 23, The Opening Night After Party on August 24, and The Saturday Night After Party on August 25. The atmosphere is perfect for movie-lovers to discuss ﬁlms they’ve seen (and hope to see). Sidewalk fosters a community feel, gathering folks from all over for panels and workshops held during the weekend. These panels are accessible to the public. Sidewalk’s ﬁlm line-up takes place mainly within two beautiful Alabama landmarks: The Alabama Theatre, which has been a staple of Birmingham’s culture and history since 1927, and the historic Lyric Theatre, which was built in 1914 as a vaudeville theater, hosting acts like The Marx Brothers, Mae West, Will Rogers, and Milton Berle. The Lyric was closed for decades, and it ﬁnally reopened after an extended renovation project in 2016. One of the special options to Sidewalk is its VIP Pass, which gets you into screenings ﬁrst. But it also gets you access to the VIP lounge, as well as to special gatherings and parties with special privileges. If you love cinema, there is no limit to the excitement of The Sidewalk Film Festival – and there is no event in the state quite like it. There’s a reason many Alabama patrons make this pilgrimage every single year. I’ll be there, and I hope you will be, too. The Sidewalk Film Festival will take place August 24- 26 in downtown Birmingham. For more details, including tickets, visit sidewalkfest.com. August Calendar of Events Kentuck Art Night: Aug. 2, 5-8 p.m. Main Avenue, Northport. This event is free to the public. For more information, visit kentuck.org/ art-night. 25th Annual CAPS Night Light Golf Tournament: Aug. 24, Tall Pines Golf Course, Tuscaloosa. This four-person scramble tournament beneﬁts Child Abuse Prevention Services (CAPS). Golfers will play nine holes before dark, enjoy a BBQ dinner, and play nine holes in the dark with glow in the dark golf balls. There will be door prizes, a grand prize, and more. For more information, visit capstuscaloosa.com or call (205) 758-1159. Midtown Village “Screen on the Green”: Saturdays through Aug. 11, 8 p.m. on the Green at Midtown Village. This free summer ﬁlm series features great kids’ movies. Bring blankets and lawn chairs and enjoy. For more information, visit midtownvillagetuscaloosa.com. Tuscaloosa Community Hospice of West AlaDancers “Nutcrackbama Casino Cabaer” Auditions: Aug. 3. ret: Aug. 24, 6-9 p.m. Clark Hall, University North River Yacht Club, of Alabama campus. Tuscaloosa. This funThe TCD production of ﬁlled evening, beneﬁting Downtown Tuscaloosa will be packed with runners on Saturday, Aug. 18, for the annual Yeah Yeah Yeah Yeah 5K and Fun run. Honorary race starter Scott Cochran will be on hand for the event, which starts and finishes at Government Plaza. Proceeds from the 5K and Fun Run will ben“The Nutcracker” will Hospice of West Alaefit the Thomas Plott Foundation, which was established to raise funding and bring forth increased knowledge about cystic fibrosis, a genetic be held Dec. 13-16. For bama, includes blackjack, disorder affecting the lungs and digestive system. For more information, and to register, visit plottfoundation.org. complete details, includroulette, and other gaming Photo: Yeah Yeah Yeah Yeah 5K ing exact times for each tables. For more inforFamily Fun Day: Aug. 11, 10 a.m.-2 p.m. Ranage group to audition, visit mation, including tickets, the Tuscaloosa Community Dancers Facebook page, or dall-Reilly (3200 Rice Mine Road NE), Tuscaloosa. visit hospiceofwestalabama.com. This free event is a great chance for everyone in the tuscaloosadancers.com. community to connect and enjoy a day of food, music, 14th Annual Walk to Remember: Aug. 25, 9:30-11 games, inﬂatables, and more – all to help raise awareFirst Friday in Downtown Tuscaloosa: Aug. 3, 5 a.m. Inside University Mall, Tuscaloosa. This annual ness about type 1 diabetes. For more information about walk honors anyone aﬀected by Alzheimer’s and other p.m.- 8 p.m. This event is free to the public. Local galleries, businesses and restaurants are open as a way JDRF, visit alabama.jdrf.org. memory disorders, as well as their caregivers. Money for the community to see what downtown Tuscaloosa raised supports the Caring Days programs. For more OLLI@UA Summer Kickoﬀ and Annual Meeting: oﬀers. For more information, visit ﬁrstfridaytuscalooinformation, call (205) 752-6840 or visit caringdays. Aug. 13, 2-4 p.m. Bryant Conference Center, Tuscalosa.com. org. osa. Enjoy refreshments while discovering everything OLLI has to oﬀer. Also, there will be a brief review of Under the Sea at CHOM: Aug. 4, 9 a.m.-4:30 p.m. Let’s Go Fly a Kite Day at CHOM: Aug. 25, 9 Children’s Hands-On Museum, downtown Tuscaloosa. the year’s accomplishments as well as board elections. a.m.-4:30 p.m. Children’s Hands-On Museum, downOLLI@UA provides mature adults, 50+, with social, Make a “Socktopus,” create a new species of jellyﬁsh, town Tuscaloosa. Design your own kite to take home. educational, and travel opportunities. For more infordesign your own egg submarine, and more. For more Add your own personal touch to the new “Children of mation, visit olli.ua.edu or call (205) 348-6482. information, visit chomonline.org or call (205) 349CHOM” kite. For more information, visit chomonline. 4235. org or call (205) 349-4235. United Way Campaign Kickoﬀ Luncheon: Aug. 14, 11:30 a.m. – 1 p.m. Bryant Conference Center, UA Calico Street Troupe Performance: Aug. 4 and 18, Keith Urban “Graﬃti U World Tour” with Kelsea campus. Meet and hear from campaign volunteers and 10:30 a.m.-Noon, Northport Civic Center. Bring the Ballerini: Aug. 26, 7:30 p.m. Tuscaloosa Amphithelearn West Alabama’s fundraising goal for the annual whole family to this free, interactive, professional ater. Tickets available via Ticketmaster.com. For more United Way campaign. For more information, visit stage play for kids which features costumed actors, information, visit Ticketmaster.com, call the Tuscauwwa.org or email julie@uwwa.org. dancers, special lighting, and music – all on a 36-foot loosa Amphitheater Box Oﬃce at (205) 248-5280 or stage. Performances teach right choices and good charcharge by phone at (800) 745-3000. Chamber Business After Hours: Aug. 14, 5-7 p.m. acter. For more information, visit calicostreet.com. Bryant Bank, Tuscaloosa. For more information, visit 2018 Chamber in Session: State of the Community: tuscaloosachamber.com. Tuscaloosa County University of Alabama Alumni Aug. 30, 11:30 a.m. - 1 p.m. The Mayor of the City of Kickoﬀ Party: Aug. 9, 6-8 p.m. The Recruiting Room Tuscaloosa, Mayor of the City of Northport, Probate 5th Annual Alabama Veterans Reunion: Aug. 18, at Bryant-Denny Stadium. This event celebrates the Judge and Chairman of the Tuscaloosa County comvarious locations in Tuscaloosa. This is a weekend beginning of a new academic and athletic year at the mission give a comprehensive update on the State of Capstone. This year’s guest speakers include Eli Gold, ﬁlled with activities and events to honor those in Alathe Community, including a Q&A time with attendees. bama who’ve served our country. Many of the events Javier Arenas, and Tommy Wilcox. For more informaFor more information, visit tuscaloosachamber.com. are free. For more information, or to register, visit tion, and to purchase tickets, visit eventbrite.com/o/ alabamaveteransreunion.com. 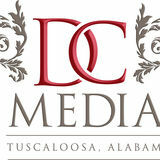 tuscaloosa-county-alumni-association-17487682840. Tuscaloosa Farmer’s Market: Saturdays, 7 a.m.noon. ; Tuesdays 3-6 p.m. Tuscaloosa River Market, Weird Contest Day at CHOM: Aug. 18, 9 a.m.Alabama Restaurant Week: Aug. 10-19. Several 1900 Jack Warner Blvd, Tuscaloosa. Shop for fresh 4:30 p.m. Children’s Hands-On Museum, downtown Tuscaloosa-area restaurants are participating in this produce, grass fed beef, baked goods, cheeses and Tuscaloosa. Compete for prizes in weird and wacky annual event, with specially priced meals. For more more. Buy fresh, buy local. For more information, visit contests throughout CHOM. For more information, information, visit alabamarestaurantweek.com. tuscaloosarivermarket.com or call (205) 248-5295. visit chomonline.org or call (205) 349-4235. Charley Wilson with Big Pokey Bear and Chuck Northport Farmer’s Market: Saturdays, 6 a.m. to 8th Annual Johnny Shines Blues Festival: Aug. 18. Johnson: Aug. 10, 7:30 p.m. Tuscaloosa Amphithenoon, 4150 5th Street, Northport. For more informaAll day at Band of Brothers Brewing Co., Tuscaloosa. ater. Tickets available via Ticketmaster.com. For more tion, visit npfarmersmarket.com. Food, drinks, and lots of blues music bands are particinformation, visit Ticketmaster.com, call the Tuscaipating in this rain-or-shine event honoring the legacy loosa Amphitheater Box Oﬃce at (205) 248-5280 or of Johnny Shines. charge by phone at (800) 745-3000. Events you want to see here? Super Mario Blowout at CHOM: Aug. 11, 9 a.m.4:30 p.m. Children’s Hands-On Museum, downtown Tuscaloosa. Collect coins for prizes, play Mario games, craft your own power-up item, and more. Costumes are welcome. For more information, visit chomonline.org or call (205) 349-4235. NOTE: chart is based on 150% of the Federal Poverty Income guidelines. For each additional member, add $522. A. General Heating and Cooling Assistance: No household may be assisted more than once for general heating and cooling payments through LIHEAP funding. The general heating/cooling assistance fund is designed to provide heating/cooling assistance to any income-eligible household. B. Crisis Heating and Cooling Assistance: Crisis assistance may only be provided to households that meet the income guidelines AND LIHEAPâ&#x20AC;&#x2122;s definition of an energy-related crisis. ene An energy-related crisis is defined by LIHEAP as a situation where a household member's health and/or well-being would likely be endangered if energy assistance is not provided. This includes households with elderly (60+) members, disabled members and/or small children (age five (5) years and younger). Household may not be assisted more than once for crisis heating and once for crisis cooling funding. CSP is currently accepting appointments for LIHEAP cooling assistance in Bibb, Choctaw, Dallas, Fayette, Greene, Lamar, Perry, Sumter and Tuscaloosa Counties. During the cooling season, June 1, 2018 - September, 28, 2018, payments are made for the primary cooling source, usually electricity. To accommodate the increase in demand, CSP implemented an automated scheduling system. Providing funding is available, the automated system schedules utility assistance appointments for Bibb, Choctaw, Dallas, Fayette, Greene, Lamar, Perry, Sumter and Tuscaloosa counties 24 hours a day, 7 days a week. To schedule an appointment in either of CSPâ&#x20AC;&#x2122;s service counties, please use one of the following contact numbers or website: (205) 758-4756 or toll free at 1-877-803-5509 clients 59 years of age and younger (205) 469-0386 clients 60 years of age and older https://cspwal.appointment.works/ea/home Elderly clients will speak with a live operator, who schedules the appointment and sends a confirmation reminder mailer, outlining items needed for a successful visit. For more information on this and other programs offered by CSP, to volunteer or to view the page, please visit our website at www.cspwal.com or contact your local CSP office.